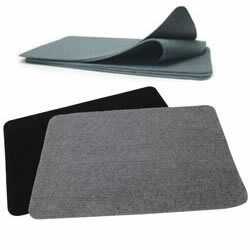 Keep your vehicle floors clean and looking new with this handy auto carpet mat. Designed to trap dirt, sand, gravel and more, it can be pulled out for easy cleaning - just shake it off! Convenient non-slip rubber backing prevents mat from sliding out of position. Order plenty to cover all your vehicle floor areas. Another great innovation from RoadPro, your trusted travel partner, providing everything you need for on-the-go living. Rollback Sunshade - 14" x 19"